HIROSHIMA, Japan, August 7, 2012 (ENS) – Japan held a solemn ceremony Monday to mark the 67th anniversary of the world’s first atomic bomb attack. About 50,000 people gathered in Hiroshima’s peace park near the center of the American bomb blast that destroyed much of the city and killed about 140,000 people. One of those attending the World War II memorial event was Clifton Truman Daniel, a grandson of Harry Truman, the U.S. president who ordered the bombing of Hiroshima on August 6, 1945. 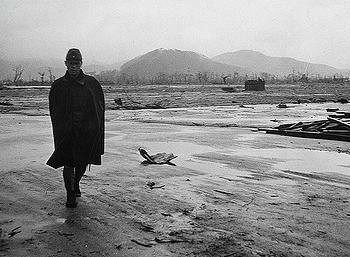 Three days later, a second atomic bombing in Nagasaki killed tens of thousands of others and prompted Japan to surrender to the Allies. A temple bell rang to open Monday’s ceremony, attended by representatives of some 70 countries. Flowers were laid before Hiroshima’s eternal flame, which is the park’s centerpiece. Speaking to reporters after the memorial, Daniel would not comment on whether his grandfather’s decision to drop the bomb was the right one. “I’m two generations down the line,” Daniel said. “It’s now my responsibility to do all I can to make sure we never use nuclear weapons again,” Japan’s Kyodo News Service reported. In a message to the Hiroshima Peace Memorial Ceremony, UN Secretary-General Ban Ki-moon urged countries to work together to eliminate the threat of nuclear weapons. “The tragedy in Hiroshima decades ago continues to resonate today,” Ban said in his message, delivered on his behalf by the UN High Representative for Disarmament Affairs, Angela Kane. “There must never be another nuclear attack – never. The elimination of such weapons is not just a visionary goal, but the most reliable way to prevent their future use,” Ban stressed. The Peace Memorial Ceremony is held to appease the souls of those killed by the atomic bomb and to pray for eternal peace on Earth, the city of Hiroshima says on its website. During the ceremony, the Peace Declaration, which appeals for the abolition of nuclear weapons and for the realization of eternal world peace, was delivered by Hiroshima Mayor Matsui Kazumi to be transmitted worldwide. The City of Hiroshima, Mayors for Peace member cities, their citizens and nongovernmental organizations, have been promoting the 2020 Vision Campaign for the total elimination of nuclear weapons by the year 2020. Mayor Kazumi and Secretary-General Ban share the belief that the stories of the hibakusha, as the victims of the bombings are known, must be heard throughout the world, to raise awareness of the effects of nuclear weapons and the need to eliminate them. Jointly produced by the UN Office of Disarmament Affairs and Japanese artist and director Shinpei Takeda, the website showcases over 60 interviews with survivors who traveled to America after the bombings to publicize the long-term impact of weapons of mass destruction. Nuclear weapons pose the single biggest threat to the Earth’s environment, scientists have warned. Even a small-scale, regional nuclear war could produce as many direct fatalities as occurred during all of World War II and disrupt the global climate for at least a decade, affecting nearly everyone on Earth, according to Richard Turco, professor in the University of California, Los Angeles Department of Atmospheric and Oceanic Sciences and a member and founding director of UCLA’s Institute of the Environment. While a regional nuclear confrontation among emerging nuclear powers might be geographically constrained, the environmental impacts could spread worldwide, said Turco, who coined the phrase “nuclear winter” in the 1980s to describe the global consequences of nuclear war. In his message to the 2012 World Conference against Atomic and Hydrogen Bombs, held after the Hiroshima Peace Memorial Ceremony, Secretary-General Ban emphasized that achieving a future without nuclear weapons would require international cooperation and called on countries to work towards this goal. U.S. Ambassador to Japan John Roos will represent the United States at the Nagasaki Peace Memorial Ceremony on August 9. Roos has traveled to Nagasaki previously, but this will be his first time attending the Peace Memorial Ceremony. Roos said the United States looks forward to continuing to work with Japan to advance President Barack Obama’s stated goal of realizing a world without nuclear weapons.